The lake trout is a member of the char family of fish. Lake trout are a native species of trout in NY waters. They can be found in the Great Lakes, Finger Lakes, and Adirondacks Lakes. These fish prefer deep colder water and can live upwards to 30 or 40 years in age. These fish can attain weights of up to 50 pounds. 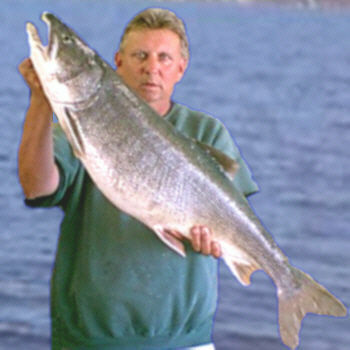 The NY state record lake trout was broken by Jesse Wykstra in August 2003 when he landed a 41 pound 8 oz lake trout from Lake Erie. 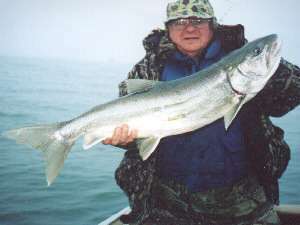 He was fishing the Dunkirk area using an NK 28 spoon off a downrigger.The old NY state record lake trout weighed 39 lb. 8oz. There is a real chance that a bigger lake trout is swimming in the depths of Lake Ontario but for now Lake Erie will hold the new record. Lake trout do not spawn in streams like the other members of the trout family. They do not build nest either. They deposit the eggs on clean gravel beds in the lake bottoms at depths from 20 to 200 feet deep. The introduction of the zebra mussel and the round gobies have had a hard impact on the lake trouts ability to reproduce naturally. The date was August 22, 2004 when Ken Kaz was out on Lake Erie fishing for walleyes. The walleyes were not biting so well so they decided to try for some lake trout. The lake trout were in a more cooperative mood. Ken is holding a very large Lake Erie lake trout that was 40 inches long and weighed an amazing 29 pounds. The fish hit a black pirate 55 spoon with a glow ladderback it was 75 ft back, and 80 ft down over 90 ft of water.The big laker fought for over 15 minutes and even tried wrapping itself in the rigger cables. The 12 pound test line held up very well. Four more lakers were also caught on that same spoon in less than an hour. That's one way to turn a bad walleye day into a great fishing trip. Pictured here is Joe Bergen from Lock Haven P.A. He is holding a nice lake trout he caught from Seneca Lake in August 2003. This fantastic lake trout fell victim to a silver streak spoon set down at a depth of 70 feet deep in 250 feet of water with a trolling speed of around 2 mph. Joe has taken Seneca Lake by storm and has been catching fish on every trip. The Finger Lakes have a very large population of lake trout. 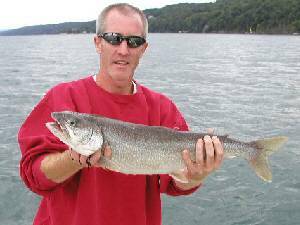 The fishing season on lake trout in the Finger Lakes is open year around. In the fall and during the winter anglers are able to catch lake trout from shore. They fish with bass minnows or egg sacs on the bottom with a slip sinker. Spoons and deep diving plugs will also catch fish as well. Hot spots are the pier in Watkins Glen, Sampson State Park, the stretch of shore line below the salt plant. Seneca Lake doesn't freeze over so these fish remain active all winter and may be caught any place along the shore line in the fall or winter. Pictured here is James Cleary from Big Flats NY. He is holding a rather large Lake Trout That weighed over 17 pounds. This fish was taken on the Niagara Bar in December of 2002. This fish took a bass minnow on a 3 way rig while drifting in about 20 feet of water. This was the first fish of the day what a way to start any fishing trip. The Niagara River and Niagara Bar area is a fish magnet during the winter months. Steelhead, Brown Trout, Salmon, and Lake Trout collect up here in the fall and provide excellent fishing all winter. The season on lake trout on Lake Ontario and it's tributaries closes September 30th and doesn't open back up till January. All lake trout caught here out of season must be returned to the water as quickly as possible. Pictured here is Justin otherwise known as Bling Bling from Newfoundland PA. he is holding a nice lake trout taken from Seneca Lake in May 2004. Justin and his buddies from PA have been fishing Seneca Lake this year and having a very good year. They have been using riggers and planner boards with a wide varity of spoons and lures. Trolling 1.9 to 2.3 MPH. Running spoons at a depth of 55 feet over 60-100 feet of water. 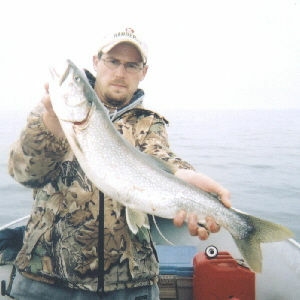 Lake trout in Lake Ontario can be caught from April through September all most any where across the lake. Several areas are better known for lakers though. The eastern end of the lake from Oswego over to Henderson Harbor has some very big lakers. The area off of Rochester also produces some very large fish as well. May and June would be the most productive months to plan on a fishing charter for lake trout. They are very active and the water hasn't warmed up and pushed them down to the deeper depths they normally would be found.